Do you ever feel like you’re stuck at a crossroads between your passions? Do you find yourself holding back because you feel like your dreams are too big, too weird, too different than what you ever thought you’d do? Do you feel led on a completely different path than you thought you’d ever be on? Lately I’ve been doing some personal introspection on what my passions actually are, as opposed to what I feel like my passions should be based on things like my degree, my friends, and my previous experiences. It seems that many of us are programmed to believe that you can only have “one” passion in life- and you can only focus on one thing. But what if our passion isn’t necessarily doing one particular thing, but in creating a life that incorporates many things that inspire and fulfill us- things that may have a common thread, but may or may not actually have anything to do with each other? As a theatre person, (I majored in theatre performance in college-) you inevitably fall into the “All-or-Nothing” mindset. You’re told to solely focus on your acting career as much as you can, whatever the cost. In such an incredibly competitive industry- I remember being repetitively told that I better put my ALL into this career or else I’ll never “succeed” (Whatever “succeeding” actually means.) So naturally, I tended to put my entire self-worth into whether a casting director thought I was right for a role or not. I basically lived for the applause. Even in non-theatre related careers, it’s the same thing, though. You are told to pursue that “one” thing. To find your “one” purpose. To invest all your time and energy into your one “career” so that you can move up in the career ranks, get your 401K, get your retirement and benefits. Naturally, after many late nights of slinging wings for rabid football fans and constant rejection in my acting career, I started drastically losing confidence in my abilities and doubting myself. I mean, I was an actress. I’d always been an actress! I was good! 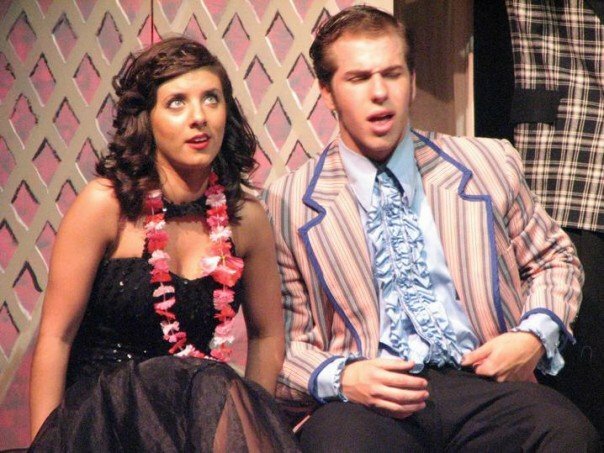 I starred in my college and high school plays! I had talent, right? This was my passion….right? Me as Rizzo in my High School production of Grease! I started losing faith in myself. There was a huge dark cloud of uncertainty over me and I doubted myself, my abilities, and my worth. That was also evidenced by a small string of loosely held together relationships that tended to either fizzle out upon the first flicker of something “real-” or smolder into a long, painful burn. I continually settled for far less than I deserved, but at the time- I felt like I deserved just that. I wasn’t “successful.” I was a struggling artist. It was my identity and I settled into it. Soon, I met my current husband who has since challenged me in every way and basically turned my world upside down. After a many and long series of random events, it’s brought me to where I am today, a work-from-home web designer and social media consultant. Who still acts. Who also lifts heavy weights. Who also works as a nutrition/lifestyle coach. Who also nerds out about matte lipstick, liquid eyeliner, and make-up brushes. Who loves to write and inspire. It’s really awesome to have many things that I happen to be good at and enjoy, it really is. But honestly it can get confusing. I’ve definitely struggled with my identity in “what I do.” Because there isn’t obvious answer. I could pick anything from the list above and turn it into a full-time career- but I’ve decided that I don’t want to. And just accepting that has been one of the most freeing things I’ve ever realized. I’ve opened myself up to just living a life filled with constant creation and bettering myself and the world around me in the ways that I can. I’m also amazingly grateful for a job that allows me to live pretty comfortably without having to scoop ranch dressing into 200 small plastic cups every morning while wearing a lunchlady hairnet. However- there are even more things that I’m so curious about and want to explore including songwriting/composing, photography and videography. I want to really make my (currently very small and underwhelming) Youtube Channel into something great. I want to create an online community for women to feel empowered in all areas. So you can imagine that with all of these thoughts- I’ve also been thinking of what direction I want to take this blog in, because clearly I haven’t been very inspired to write. (Sorry!) And I realized something. It was because I wasn’t interested in just sharing recipes or workout tips with my readers anymore. While that is still a part of who I am- it isn’t what I think about all the time. I’d rather compose a song on my keyboard or research new make-up techniques than read articles about the latest workout or “clean-eating” trend. Fitness at this point has become an automated part of my life. Something that fulfills me, keeps me healthy, lean, and strong, and ready and raring to go for all the other work I do in my life. I’d rather spend my time creating. Writing. Inspiring. So I guess I should announce I have a huge revamp of this very blog coming up soon! In this new re-design, I want to create a haven of community and inspiration for women all over to love themselves wholeheartedly. To learn, to create, to be their fullest, most confident selves. For women who want to strive for more than just an “after” photo. I’m not abandoning my current philosophies on fitness or nutrition- I just don’t want that to be the main focus anymore. It started off as a passion for me that turned into a natural part of life that has opened me up to higher-level thinking and philosophies. I want to explore the world of body-image and mindset with more of a fervor, but I also don’t want to be limited to just that. I challenge you to think about your life, your passions, and your goals. Don’t let yourself be held back by what you think you “should” be passionate about. It’s YOUR life! Dream BIG. Explore. Be curious. Never stop learning. And always be willing and open to be taken in a brand new direction- it may just change your entire mindset altogether. We Have To Be Thin. Who are Ana and Mia?